Author Gillian Houghton brings to vivid life the maritime culture of Gloucester, the rough-and-tumble existence on a swordfishing boat, and the desperate lives of the swordfishers that make taking dangerous risks with the weather a necessity. Included in this compelling story are first-person observations of the crew's friends and family, accounts of radio messages from the Andrea Gail's captain, and a timeline that charts the ship's last turbulent hours. 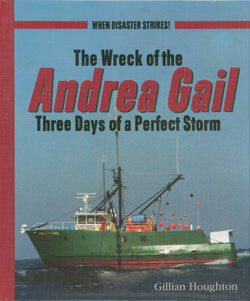 Also included are photos of the Andrea Gail that have never been published before!